Niamh is delighted to be receiving eight times more traffic from Germany than a year ago. Sarah suggested a move to a new e-commerce platform that could support multicurrency prices and multilingual content, a task that has now been completed and is bringing in customers from all around the world. 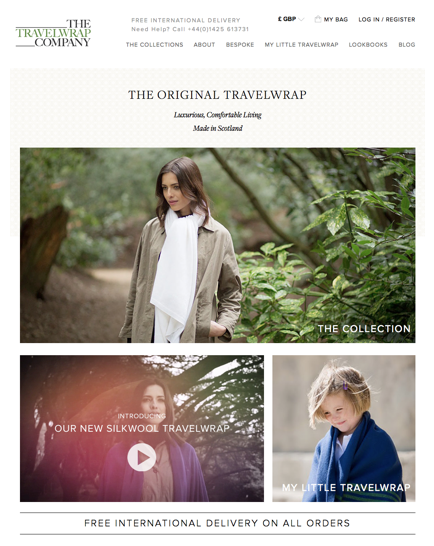 Over a third of The Travelwrap Company’s turnover is now from export, with a significant increase in international sales in the last year.The Travelwrap Company, founded by Niamh Barker, has been selling luxury Scottish cashmere travelwraps since its inception in 2007. Using only the finest long-haired yarn from the underbelly of the goat, the travelwraps are produced in a well-established Scottish mill recognised as creating some of the best cashmere products in the world. 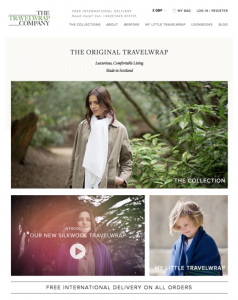 In addition to the luxurious wraps in a palette of colours, the product range has grown to incorporate ‘My Little Travelwrap’ for children and babies. Having won several prestigious awards, including Luxury Gift of the Year and Best New Business in the UK, Niamh felt sure The Travelwrap Company would succeed in overseas markets, “These days, with our ever-shrinking planet, offering something that is the best in the world can create success all over the globe!”. Niamh realised the website would be vital in attracting new overseas customers. However, the existing website was clearly not helping the business to reach its export potential and, with just a small team, it became apparent that expert help would be needed. Tasked with enhancing its suitability for international customers and boosting export sales, Sarah analysed The Travelwrap Company’s existing website and also met with Niamh to understand her longer-term international objectives for the business. Sarah’s review identified several key areas of focus and she provided clear, step-by-step advice to enable the Travelwrap team to undertake the suggested improvements. Search engine optimisation: surprisingly, the website was not being picked up in key export markets, “It was a revelation to me,” exclaimed Niamh. “We were not appearing in search results in our target markets such as Australia. We were essentially invisible!” Sarah’s review helped Niamh understand how to optimise their website for international trade. Tailored marketing communications: the review recommended targeting each market individually with a two-pronged online and offline approach. For example, in addition to developing specific German web pages, a German-speaking PR agency was engaged to help identify the most appropriate German e-marketplaces and build brand awareness. E-commerce transformation: it was important to provide a simple and user-friendly buying process for each market: customers in certain countries prefer payment by credit card, PayPal, or direct bank transfer, as well as paying in their local currency with different delivery options. Sarah helped Niamh to appreciate the languages, currencies, payment gateways and delivery options to enable the company to tailor their service to each market. Following the review, The Travelwrap Company has set up targeted web-pages for Australia, the USA, Germany, France, Poland and Japan. Traffic to the German site increased eight-fold and the website appeared in key searches internationally, with the company enjoying orders from across the globe. Sarah also suggested that Niamh move to a new e-commerce platform, that could support multicurrency prices and multilingual content, a task that has now been completed. Over a third of The Travelwrap Company’s turnover is now from export, with a significant increase in international sales in the last year.